New LA County Sheriff Ran on Reform, But Will He Deliver? 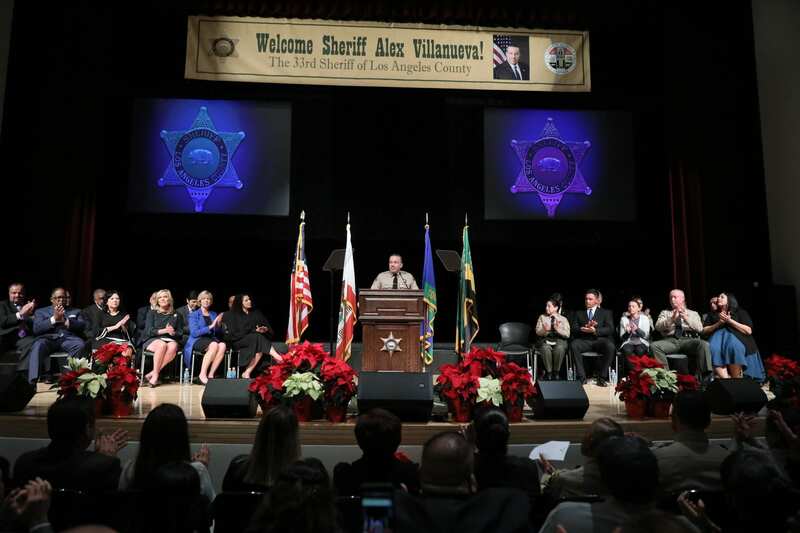 LOS ANGELES – When Los Angeles County Sheriff Alex Villanueva took office Monday, he didn’t address how he would fulfill promises to reform a scandal-ridden department and ensure his officers serve all residents, including immigrants, equitably. Villanueva, a Chicago-born retired LA County sheriff’s lieutenant who first joined the force in 1986, is the first Democrat and first Latino to wear the sheriff’s badge in the county in more than 130 years. He was the first to unseat an incumbent LA County Sheriff in 104 years. Villanueva’s come-from-behind underdog victory surely benefited from strong Democratic voter turnout in the Nov. 6 election, but also hinged on progressive campaign promises to increase diversity in the ranks and “reform, rebuild and restore” the department. But the usual campaign rhetoric shifted toward unusually progressive positions for a sheriff candidate. Villanueva, 55, said he would cut ties with federal immigration authorities, promote diversion programs to lower the county jail population and oppose a $3.5 billion jail expansion. Esther Lim, director of the American Civil Liberties Union of Southern California’s jails accountability project, said in an interview the progressive promises “are points that advocates clung to” but they’ll be quick to drop their support if Villanueva doesn’t follow through. Frank Zerunyan, an attorney and public policy professor at the University of Southern California in Los Angeles, agrees. “It’s one thing to run a political campaign and another thing to govern.” Zerunyan said in an interview. Villanueva began work immediately, removing or demoting the undersheriff, eight chiefs and other department leaders in his first action. At his swearing-in – which had the air of a political rally – Villanueva told the crowd he would kick U.S. Customs and Immigration Enforcement out of the county jail system, the largest in the country. The promise earned him endorsements from labor unions and community organizations like the Coalition for Humane Immigrant Rights Los Angeles. Leserman said “ICE has no business being in the jails,” but added those in jail who are considered dangerous would be handed over to federal agents. Former Sheriff Jim McDonnell firmly defended county collaboration with federal immigration officials during his time in office and opposed Senate Bill 54, which limits local police collaboration with ICE. Some say that position led to his defeat. McDonnell initially refused to concede until vote tallies three weeks after the election showed Villanueva with an insurmountable 52 percent lead. McDonnell, who outraised Villanueva 8 to 1, became the first incumbent sheriff in over a century to be ousted in an election. In a Nov. 27 farewell speech, McDonnell called himself “as apolitical as a person can be” and said Villanueva’s partisan rhetoric during the campaign was unnecessary and a distraction. But the sheriff’s seat was already politicized according to Mark Gonzalez, chairman of the Los Angeles County Democratic Party, which endorsed Villanueva for sheriff in the race – a first for the party. “When you had a former sheriff who allowed ICE into jails and who took a negative stance on the Sanctuary State bill, that’s when the office was politicized,” Gonzalez said in an interview. The party backed Villanueva with robocalls and on-the-ground volunteers to knock on doors across the county. “This was about reform and holding [McDonnell] accountable,” Gonzalez said, adding voters wanted a change from the McDonnell’s “Trump-esque” values. Zerunyan, an Armenian immigrant who served three terms as mayor of the LA County town of Rolling Hills Estates, called the county’s collaboration with ICE a “political” issue that Villanueva will have to learn to navigate. Still, an air of uncertainty looms over Villanueva’s agenda and how progressive it will actually be. He backed out of a campaign promise to hold a first-day press conference with community activists to highlight transparency and building trust with communities. As part of his leadership changes, Villanueva removed two constitutional policing advisers from the department whose consultation was critical for the department’s review of police shootings. Villanueva has said he opposes granting subpoena power to the Civilian Oversight Commission, an independent watchdog group overseeing the department. LA County voters will decide the issue in the 2020 election. Lim said that while subpoena power “won’t be a fix-all” since the commission can only make recommendations and has limited access to department disciplinary documents, it would be a significant victory for police accountability activists who want stronger oversight. In the coming months, the ACLU and other community organizations will present Villanueva with an “accountability document” listing his proposed reforms and questions about when they will be implemented. The document and Villanueva’s responses will be made public.